Software Development for Desktop and Web. Software development is what Cluey Solutions professionally does for the last 7 years. We are experts in rapid custom development of web-based, distributed and standalone applications designed to meet your organisation's specific requirements and business needs. We follow proven practices that allow for successful project completion, and deliver solutions that exceed customer expectations. We have experience with working with broad range of customers, from individuals, SOHO and medium sized business. Oracle RDBMS, SQL, PL/SQL, Applications, Security and disaster Recovery. 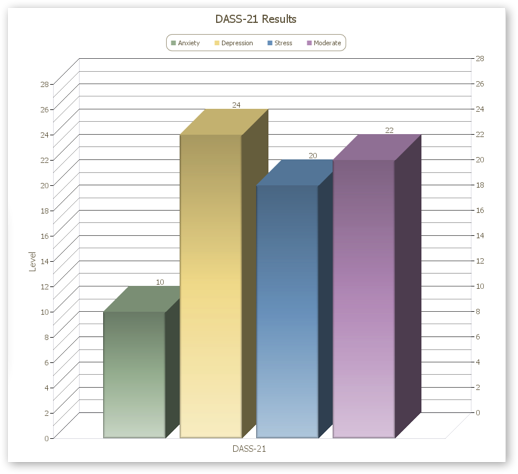 eDASS - Is a iPad based standalone or networked Depression Anxiety Stress Scales (DASS) system is a self report instrument designed to measure the three related negative emotional states of depression, anxiety and tension/stress. More detailed information of DASS can be found here. eDASS is a valuable resource for Physiologist and Medical practitioners as it saves the manual paper based and time consuming current DASS-21 procedure. eDASS will automatically calculate, graph and email the results to several addresses for further review and consultation. A customised copy for your business can be obtained for $400 by emailing Ray Burg. Further customisations and networking features can be arranged on request.